This large, gorgeous and highly collectible Green Multicolor Onyx Gemstone Egg was mined, carved and richly polished by hand to a high gloss finish in Pakistan � the home of the highest quality and most beautiful Green Multicolor Onyx in the world. Sought after by both beginning and serious gemstone egg collectors and home decorators alike, it is an excellent example of this how this lovely translucent, semi-precious gemstone grows within Mother Earth. The beautiful, mesmerizing and natural patterns of pale green Onyx divide two sides of whirling and banded colors of light to dark shades of brown making this marvelous Green Multicolor Onyx Gemstone Egg truly one of a kind (we purposely photographed this egg this way in order to show both sides). It will certainly make an impressive and beautiful addition to any new or existing gemstone egg collection, a wonderful Easter, or spring time display, as well as a thoughtful and sure to be treasured unique gift! And remember - gemstone eggs are perfect for use in crystal healing, chakra therapy, meditation and therapeutic massage too! 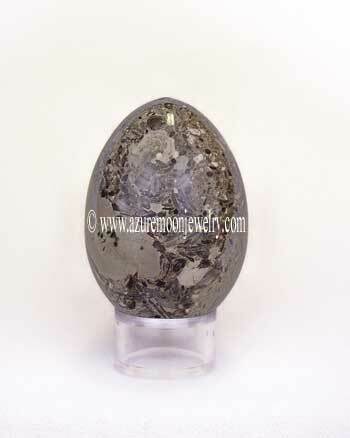 This Green Multicolor Onyx Gemstone Egg is the size of a duck's egg and measures approximately 2 3/4� L - 1 15/16� W and weighs 230 grams or 1150 carats. The crystal clear acrylic display stand is included. 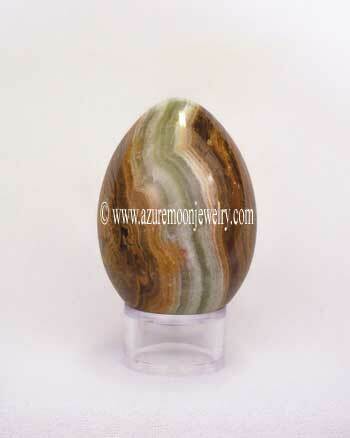 Please note that this is a 100% natural, polished Green Multicolor Onyx Gemstone Egg with natural banding, striations and veining, as well as some small natural flaws that occurred during the Onyx's growth process which add interesting and unique characteristics to the gemstone. Said striations, veining and natural flaws are not considered a defect, but rather a characteristic of the natural beauty and wonder of the earth's geology. Green Multicolor Onyx, as well as all colors of Onyx, is the alternate birthstone for the month of February. Green Multicolor Onyx, as well as all colors of Onyx, is the zodiac stone for those born under the astrological sign of Leo. Green Multicolor Onyx, as well as all colors of Onyx, is the 7th wedding anniversary gemstone. Chakra application depends upon the stone's color. Metaphysical Properties: Green Multicolor Onyx, also known as Green Banded Onyx, Multi Green Onyx, or Pakistani Onyx, has been used to banish grief, enhance self control, stimulate the power of wise decision making and to encourage happiness and good fortune. It helps one to absorb from the universe those energies which are needed and helps one to become the master of ones own future. It can also be used to deflect or absorb the negativity of others. Click here to learn more about the lore and metaphysical properties of Green Multicolor Onyx and other popular gemstones.